Cabbage (Brassica oleracea var. capitata) likes it cool, even a bit frosty, but when it gets hot, this vegetable languishes. 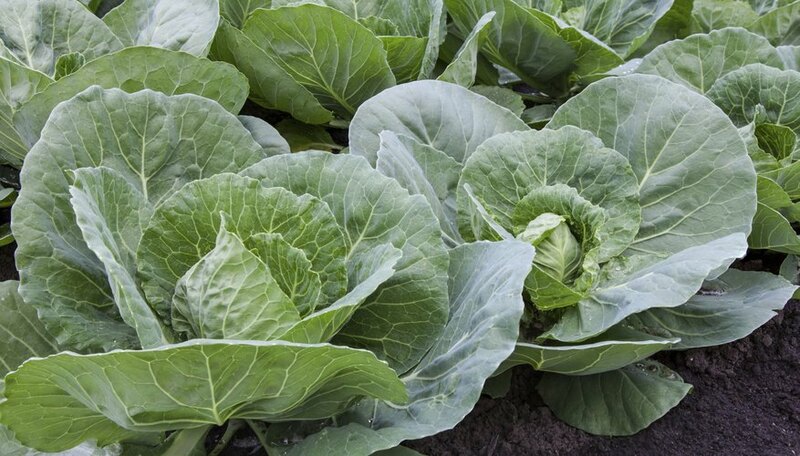 You can grow two cabbage crops a year during the cool seasons if you time it right, but when, and what variety to plant depend on the length of the growing season in your area. Plant cabbage seedlings three to four weeks before the last frost date in your area or when daytime temperatures are reliably 50 to 55 degrees Fahrenheit. Cabbage thrives until the temperatures reach or exceed 80 F. In areas with cool summers, you can plant cabbage any time in spring, but if it gets hot in your climate, plant cabbage as soon as conditions are right. If you have a short spring followed by a hot summer, plant a short-season variety that matures in 60 to 65 days. Short-season varieties include "Jersey Wakefield" and "Pacifica." Long-season cabbage varieties can take up to 100 or more days to mature. In mid to late summer, plant a second cabbage crop for a fall harvest. Short-season varieties are best for this second planting. Because they mature in two to three months, plan to harvest before the first killing frost. Cabbage can survive a mild frost, but any prolonged cold will kill the plant. Cabbage plants benefit from some shade through the heat of the afternoon when you're planting in fall. While tropical and subtropical climates make cabbage an impossible part of the late spring and summer garden, you can grow this cool-weather vegetable from fall through early spring. In frost-free climates, plant cabbage in late fall or winter when temperatures have dropped below 75 F. Cabbage grows actively through the winter in areas where temperatures remain at or above 45 F and won't suffer if it dips below freezing for a few days. You can plant cabbage from seed either directly in the garden or in pots indoors for transplanting. Starting cabbages indoors allows you to get a head start on the season. For spring planting, start seeds indoors six to eight weeks before the last frost date. If you're starting cabbage from seed in midsummer, either start the seeds indoors in a cool bright spot, or in the garden where they get afternoon shade. Cabbage seeds germinate in soil between 45 and 85 F. Once in the soil, the seeds germinate and emerge within four to seven days. You can prolong the harvest by planting cabbage seeds or seedlings over several weeks as long as the last cabbages you plant have time to mature before summer's heat or winter's freezes. Plant every two weeks starting with any long-season varieties you are growing. Plant short-season varieties that need 60 days or fewer to mature last.